“Deputy Lieutenant, High Sheriff, Lord Mayor, Minister, Distinguished guests, Ladies and Gentlemen. It is a GREAT honour to welcome you today to the inaugural Emergency Services Festival of Thanksgiving. Special thanks are due to Dean Rogers Govender and Canon Marcia Wall for their help and assistance organising the Festival. I want to also thank the NESM Trustees and Ambassadors who do incredible work and quite simply, the Charity could not make progress without them. Last but by no means least, thanks to you all for being here today– some of you have travelled a short distance and some have travelled as far as from Northern Ireland and Scotland. We have with us today, Emergency Services personnel from all four countries of our United Kingdom, and the wreaths to be laid later on will be from all four corners of the UK. I’d like to tell you about the charity – which, I am delighted to announce is also a registered charity in Scotland too as of this week – I’ll tell you how NESM came about and share with you our vision for the future. My grandparents, John and Joan Scholes, who are with us today, were both police officers with Greater Manchester Police. In 2001, PC Alison Armitage of GMP was tragically killed in Hollinwood – not too far from here – when she was run over by a stolen vehicle. My grandfather showed me the tree Officers had planted in memory of PC Armitage and told me that in this country we don’t look after the emergency services as much as we should. Those words stuck in my mind. A few years ago, I decided to research ways in which we can honour and promote the incredible work carried out by all of our emergency services. I was amazed to find that whilst we had a Military Cenotaph on Whitehall, and individual police, fire and ambulance memorials, we lacked a single cenotaph for ALL emergency services – we do not have ONE NATIONAL, symbol of gratitude, sacrifice and remembrance. I was honoured to lay the wreath in the middle, alongside colleagues from the police, fire, ambulance and search and rescue services. There is a National Emergency Services Memorial in Australia, and there are similar memorials across the world – but not one here in the UK. Nearly TWO MILLION people currently serve in our emergency services, including many volunteers. Nearly 2 million people striving to help others; nearly 2 million people working in partnership and collaboration which plays a key role in the provision of emergency services. MORE THAN 7,000 personnel have been killed in the course of duty in the last 200 years. If you look at those statistics, millions and millions of people have served our Nation, helping others, saving lives and upholding law and order. In 2016 I became determined to make building a national memorial for the selfless men and women of the emergency services a personal ambition. 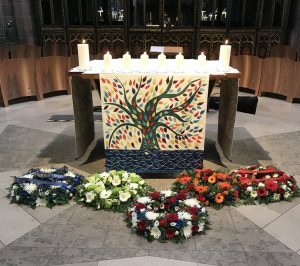 Since the official launch in September 2017 NESM has grown from strength to strength – with a vision of raising £3 million to build a national emergency services memorial, a LASTING cenotaph which will stand for hundreds of years. If we are to educate the public, engage with them on the work we do, and recruit the next generation of emergency service personnel then it is of the utmost importance that we involve as many people as possible in the selection of the location for the memorial. This will at the same time remind people of the sacrifices made by emergency services personnel. The NESM Trustees are very fortunate to have not only The Prime Minister’s support, but the support of all living former Prime and Deputy Prime Ministers, the First Ministers, Home Secretary, The Police and Fire Minister, Shadow Police Minister and very nearly all political leaders from across the UK and Devolved Bodies. 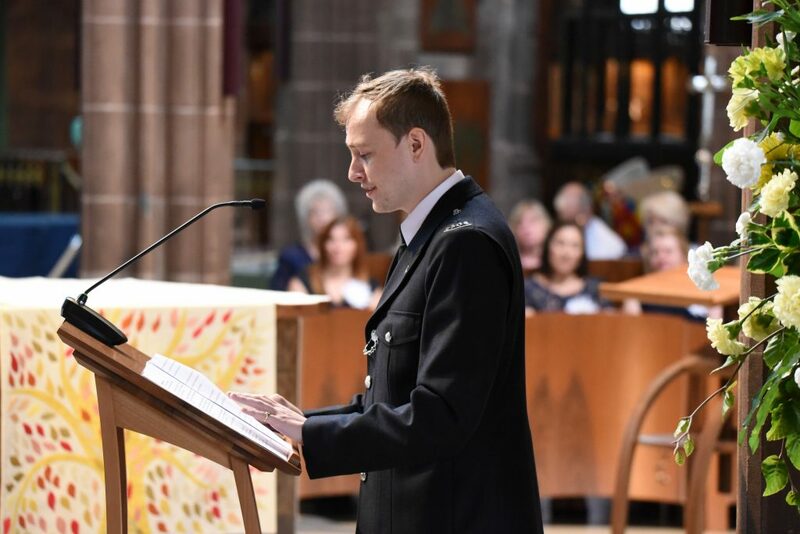 You will see on the final page of your order of service, that we also have the support of several emergency services and organisations and the list is growing all the time. In addition to building a NESM, we will also have an annual Service of Thanksgiving for the emergency services. This will rotate around the UK and take place on the nearest Friday to 9th September. You may also know that the Prime Minister gave her backing to the creation of an annual day across our United Kingdom, to celebrate the work of the emergency services. This was inspired by the excellent work being done with the Armed Forces Day and the 999 Day will take place on 9th September every year. I’m delighted this has the backing of the Home Secretary, Police and Fire Minister and Shadow Police Minister. I am proud that on Sunday, the 999 Day flag will fly outside the Home Office and many other buildings across the UK, thanks to the approval from Nick Hurd. all are proud to serve; all have a role to play. We are all united by a desire to serve others and put others before self, serving in a United Kingdom. We are a United Kingdom and United we serve. Speech is copyright protected to Tom Scholes-Fogg. Kindly seek permission before using the text. Image of TSF taken by @Fire_Photos.